The increasing use of mobile phones may have a number of physiological and psychological effects on human health. Many animal and human studies have reported various effects on the central nervous system and cognitive performance from of exposure to electromagnetic fields (EMF) emitted by mobile phones. The aim of the present study was to evaluate the effects of mobile phones on the morphology of the human brain and on cognitive performance using stereological and spectroscopic methods and neurocognitive tests. Sixty healthy female medical school students aged 18–25 years were divided into a low exposure group (30 subjects, <30 min daily use by the head) and high exposure group (30 subjects, >90 min daily use by the head). 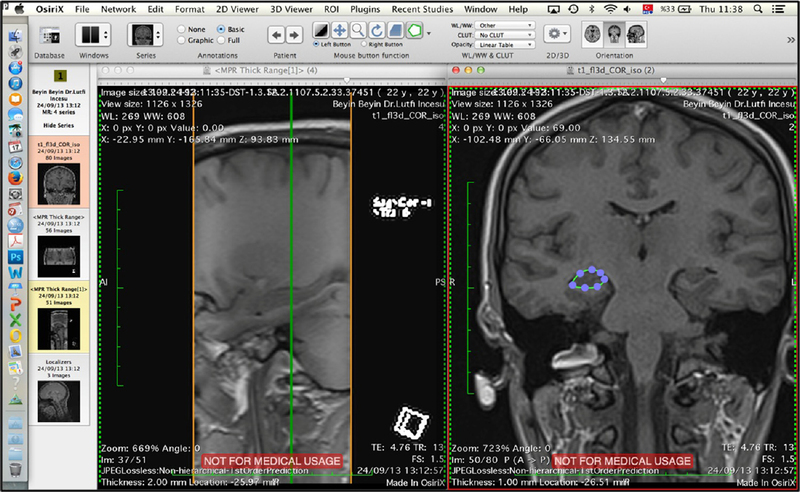 Magnetic resonance images (MRI) of the brain analysed on OsiriX 3.2.1 workstation. Neuropsychological tests were performed for each subject. In addition, three dominant specific metabolites were analysed, choline at 3.21 ppm, creatine at 3.04 ppm and N-acetyl aspartate at 2.02 ppm. Analysis of the spectroscopic results revealed no significant difference in specific metabolites between the groups (p > 0.05). There was also no significant difference in terms of hippocampal volume between the groups (p > 0.05). In contrast, the results of the stroop and digit span (backward) neurocognitive tests of high exposure group for evaluating attention were significantly poorer from low exposure group (p < 0.05). Based on these results, we conclude that a lack of attention and concentration may occur in subjects who talk on mobile phones for longer times, compared to those who use phones relatively less. 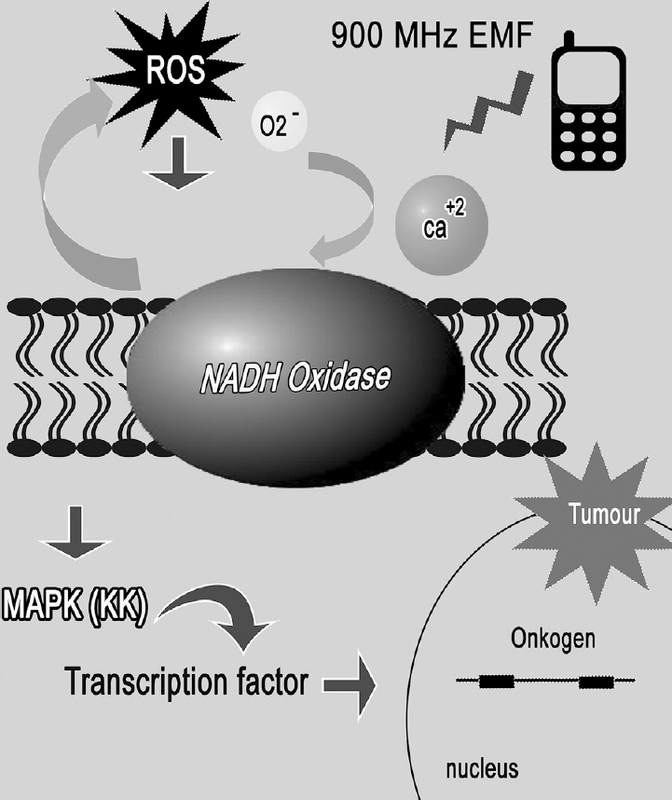 Because of increased use of cell phones, the purpose of this study was to investigation of the oxidative damage caused by electromagnetic radiation (EMR) emitted by cell phones and histological and morphometrical determination of the possible protective role of folic acid (FA) in preventing the detrimental effects of EMR on the kidney. Twenty-four adult male Wistar albino rats were divided into control (Cont), EMR, EMR + FA and FA groups, each containing six rats. The EMR and EMR + FA groups were exposed to EMR for 60 min a day over a period of 21 days, while no EMR exposure was applied to the Cont and FA groups. The source of the EMR was an EMR device which emits a digital signal producing 900-MHz frequency radiation. 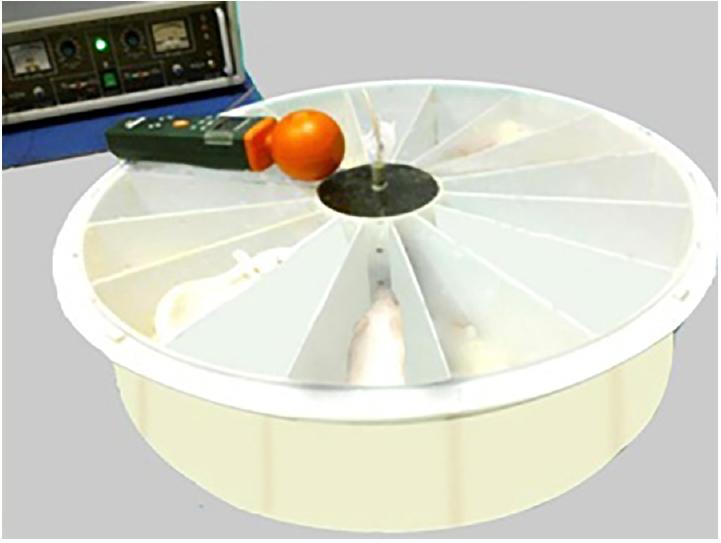 The generator connected to a one-monopole antenna was used in this study and the rats were placed in the plexiglass restrainer at an equal distance from the monopole antenna. 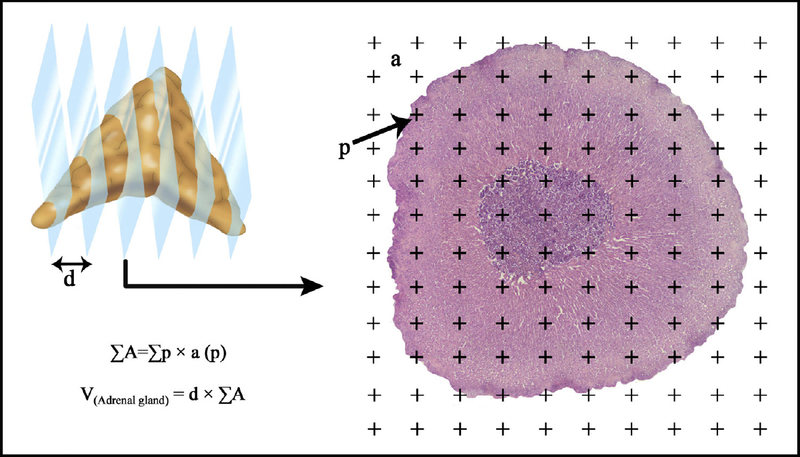 Following the experimental period, and after tissue processing, a physical disector-Cavalieri method combination was applied to the sections. The mean volume of the cortex, medulla, proximal and distal tubules increased significantly in the EMR groups compared to the Cont group (p < 0.01). Contrarily, the total number of glomeruli in the EMR group decreased compared to the Cont group (p < 0.01). The protective effects of FA was observed in the kidney (p < 0.05). In conclusion, the 900-MHz EMR leads to kidney damage. FA may exhibit a protective effect against the adverse effects of EMR exposure in terms of the total number of glomeruli. Background: Short morning exposure to high illuminance visible electromagnetic radiations termed as artificial daylight is beneficial for the mental health of people living in geographical areas with important seasonal changes in daylight illuminance. However, the commercial success of high illuminance light sources has raised the question of the safety of long hour exposure. 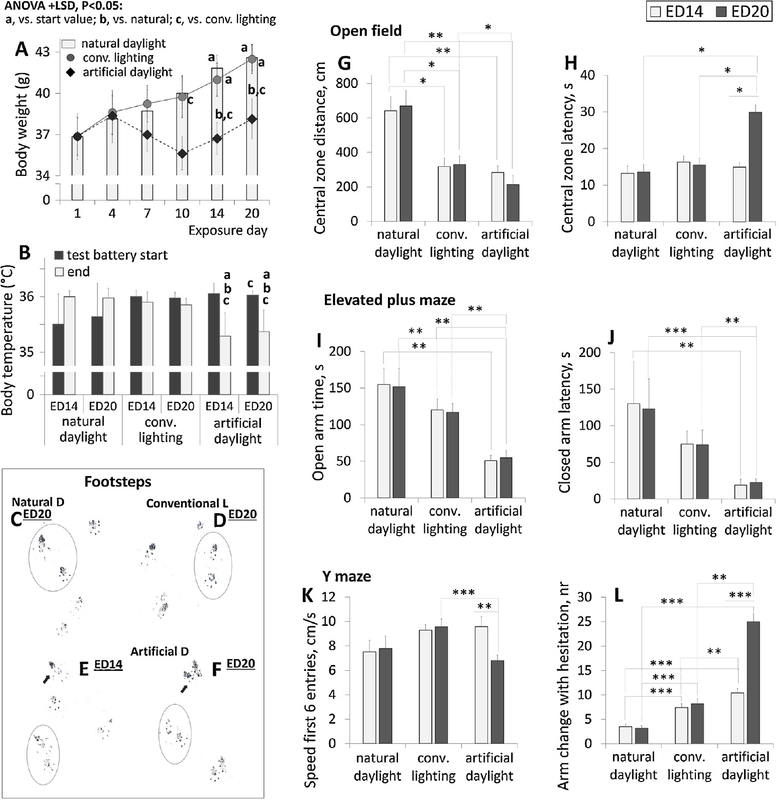 Methods: We have investigated the effect of the replacement of natural daylight by artificial daylight in Swiss mice raised under natural lighting conditions. Mice were monitored for neurotoxicity and general health changes. They were submitted to a battery of conventional tests for mood, motor and cognitive functions' assessment on exposure day (ED) 14 and ED20. 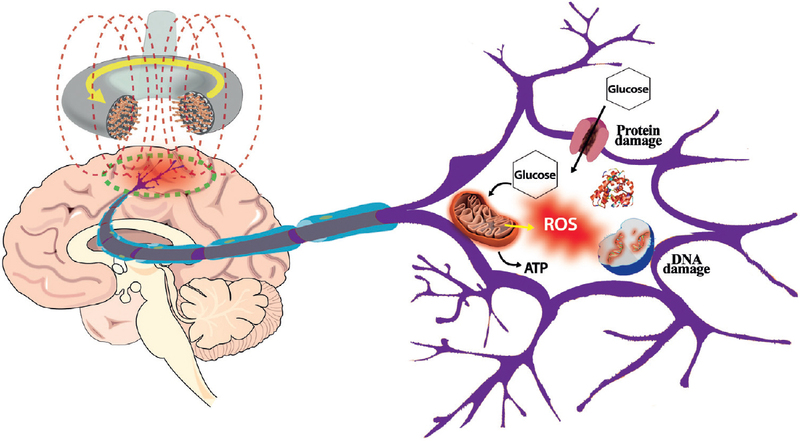 Following sacrifice on ED21 due to marked signs of neurotoxicity, the expression of markers of inflammation and apoptosis was assessed in the entorhinal cortex and neurons were estimated in the hippocampal formation. Results: Signs of severe cognitive and motor impairments, mood disorders, and hepatotoxicity were observed in animals exposed to artificial daylight on ED20, unlike on ED14 and unlike groups exposed to natural daylight or conventional lighting. Activated microglia and astrocytes were observed in the entorhinal cortex, as well as dead and dying neurons. Neuronal counts revealed massive neuronal loss in the hippocampal formation. Conclusions: These results suggest that long hour exposure to high illuminance visible electromagnetic radiations induced severe alterations in brain function and general health in mice partly mediated by damages to the neocortex-entorhinal cortex-hippocampus axis. These findings raise caution over long hour use of high illuminance artificial light. The radiation emitted from mobile phones has various deleterious effects on human health. This study was conducted to evaluate the effects of exposure to the 900-MHz radiation electromagnetic fields (EMF) emitted by mobile phones on Ammon’s horn and the dentate gyrus (DG) in the hippocampus and cerebellum of male Wistar albino rats. We also investigated the neuroprotective effects of the antioxidants Boswellia sacra (BS) and folic acid (FA) against exposure to EMF. Twenty-four adult male rats were randomly divided into four groups of six animals each, an EMF group, an EMF + FA exposure group (EFA), an EMF + BS exposure group (EBS) and a control group (Cont). The EMF, EFA and EBS groups were exposed to 900-MHz EMF radiation inside a tube once daily over 21 days (60 min/day). The Cont group was not exposed to 900-MHz EMF. The results showed that EMF caused a significant decrease in total pyramidal and granular cell numbers in the hippocampus, and DG and in Purkinje cell numbers in the cerebellum in the EMF group compared to the other groups (p < 0.05). BS and FA attenuated the neurodegenerative effects of EMF in the hippocampus and cerebellum. Significant differences were also determined between the numbers of neurons in the EFA and EMF groups, and between the EBS and EMF groups (p < 0.05). However, there were no significant differences among Cont, EFA and EBS (p > 0.05). Our results may contribute to ongoing research into the effects of 900-MHz EMF exposure. During the last few decades there has been an enormous increase in the usage of cell phones as these are one of the most convenient gadgets and provide excellent mode of communication without evoking any hindrance to movement. However, these are significantly adding to the electromagnetic field radiations (EMF-r) in the environment and thus, are required to be analysed for their impacts on living beings. The present study investigated the role of cell phone EMF-r in inciting oxidative damage in onion (Allium cepa) roots at a frequency of 2100 MHz. Onion roots were exposed to continuous wave homogenous EMF-r for 1, 2 and 4 h for single day and generation of reactive oxygen species (ROS) in terms of malondialdehyde (MDA), hydrogen peroxide (H2O2) and superoxide anion (O2•−) content and changes in the activities of antioxidant enzymes- superoxide dismutases (SOD) and catalases (CAT) were measured. 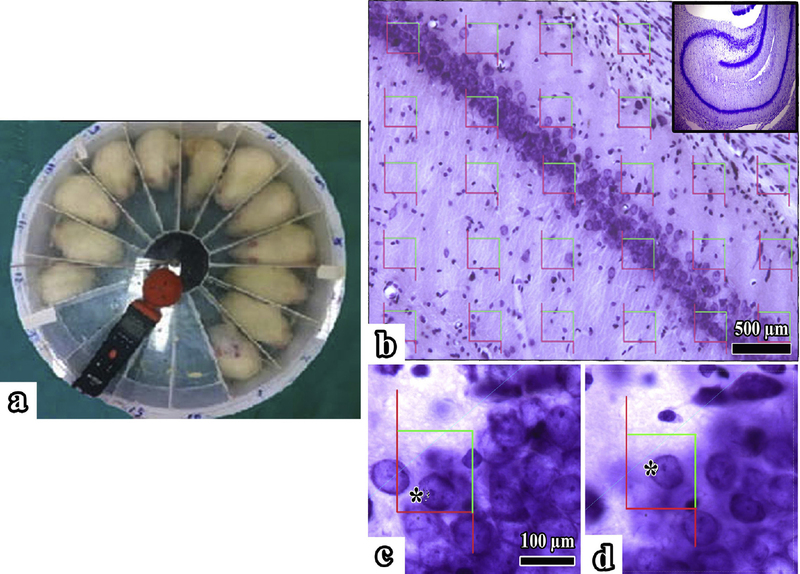 The results showed that EMF-r exposure enhanced the content of MDA, H2O2 and O2•−. Also, there was an upregulation in the activity of antioxidant enzymes− SOD and CAT− in onion roots. The study concluded that 2100 MHz cell phone EMF-r incite oxidative damage in onion roots by altering the oxidative metabolism. The purpose of the study was to investigate the effects of pulsed digital electromagnetic radiation emitted by mobile phones on the central nervous system of the adult Wistar albino rats. The study evaluated structural and functional impacts of four treatment arms: electromagnetic field (EMF) exposed; EMF exposed + melatonin treated group (EMF + Mel); EMF exposed + omega-3 (ω3) treated group (EMF + ω3); and control group (Cont). The 12-weeks-old rats were exposed to 900 MHz EMF for 60 min/day (4:00–5:00 p.m.) for 15 days. Stereological, biochemical and electrophysiological techniques were applied to evaluate protective effects of Mel and ω3. Significant cell loss in the CA1 and CA2 regions of hippocampus were observed in the EMF compared to other groups (p < 0.01). In the CA3 region of the EMF + ω3, a significant cell increase was found compared to other groups (p < 0.01). Granular cell loss was observed in the dentate gyrus of the EMF compared to the Cont (p < 0.01). EMF + ω3 has more granular cells in the cerebellum than the Cont, EMF + Mel (p < 0.01). Significant Purkinje cell loss was found in the cerebellum of EMF group compared to the other (p < 0.01). EMF + Mel and EMF + ω3 showed the same protection compared to the Cont (p > 0.05). The passive avoidance test showed that entrance latency into the dark compartment was significantly shorter in the EMF (p < 0.05). 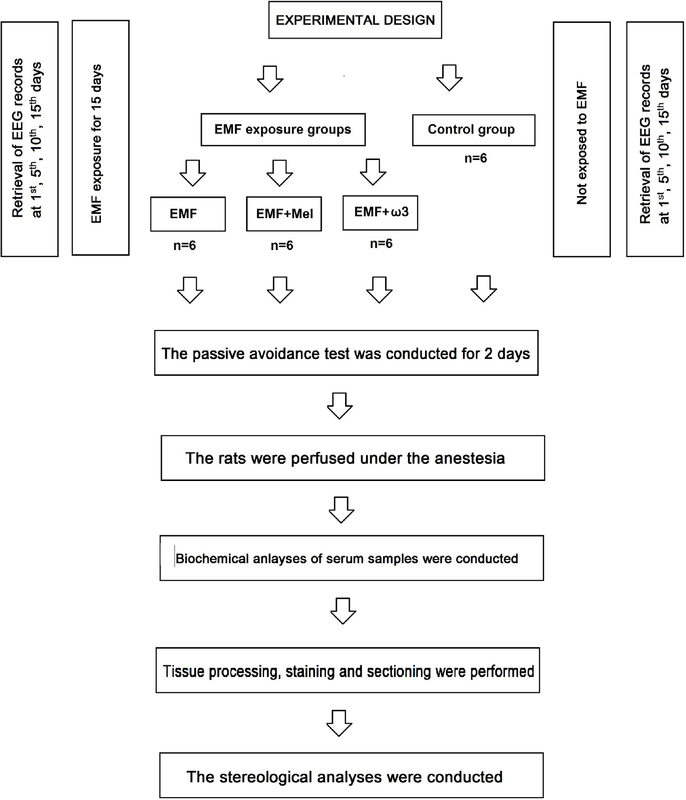 Additionally, EMF had a higher serum enzyme activity than the other groups (p < 0.01). In conclusion, our analyses confirm that EMF may lead to cellular damage in the hippocampus and the cerebellum, and that Mel and ω3 may have neuroprotective effects.